I want to speak to their souls." re-ignites your spirit. For John Coltrane, that lifeline was the saxophone, and the dreams it inspired. Drawn along by saxophone greats like Lester Young and Johnny Hodges, John's life changed overnight when he heard Bebop master Charlie Parker. Still, the sadness that had clung to him since childhood--and his father's death--led to drinking and drug use that finally brought his early success to a standstill. In a moment of great courage, John remembered the words of his grandfather, Reverend Blair, and cleansed his body of the deadly habits weighing him down. Following a spiritual revelation, he set free his enormous talent to soar like an angel of sound. With the creation of his masterpiece A Love Supreme, he offered a timeless gift of gratitude to the Divine. "Lyrically narrated, resplendently illustrated and deeply respectful of both subject and audience." 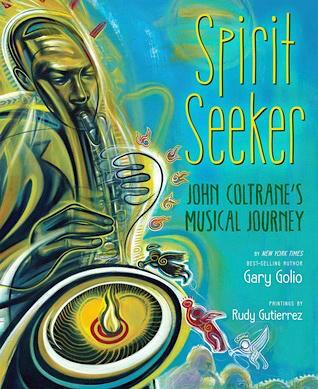 "Golio and Gutierrez present a portrait of John Coltrane's lifelong quest to discover and share his spiritual search through music." "A well-conceived marriage of art and text breathes life and passion into this picture biography. Swirling strokes of vibrant colors give the book an almost cinematic quality, animating Coltrane's passionate journey." "The dizzying heights and lowest moments of John Coltrane's life are portrayed with energy and care." "this is, in many ways, a spiritual biography, the story of a man who set out to speak to the souls of his fans--and ultimately succeeded in doing so"
"Golio's portrayal travels into the depths of Coltrane's addiction, and onward to his spiritual reawakening. Gutierrez's wildly kinetic and occasionally fantastical paintings are appropriately heartfelt and groovy." "This picture book pushes the boundaries of the form, in the depth and complexity of its hero, the sophisticated imagery of its art, and the grandeur of its message."